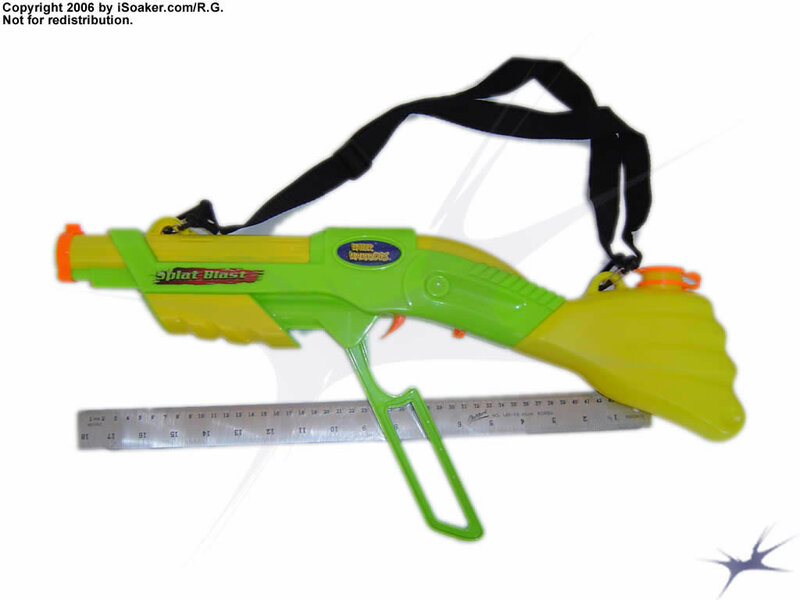 The Water Warriors Splat Blaster is one of the more novel soaker designs for 2006. Unlike other soakers, the Splat Blaster has a complementary feel to it, in that the soaker feels more like one that should be used in combination with another, being pulled out in more specific situations. In the case of the Splat Blaster, that situation would be for closer-ranged targets as will be discussed below. The Splat Blaster has a single, wide-orifice nozzle. The actual nozzle lies within the larger housing and is capped by a plug that folds down when the trigger is pulled. This mechanism is rather different than those seen on other soakers, but makes sense for the purpose of the Splat Blaster. 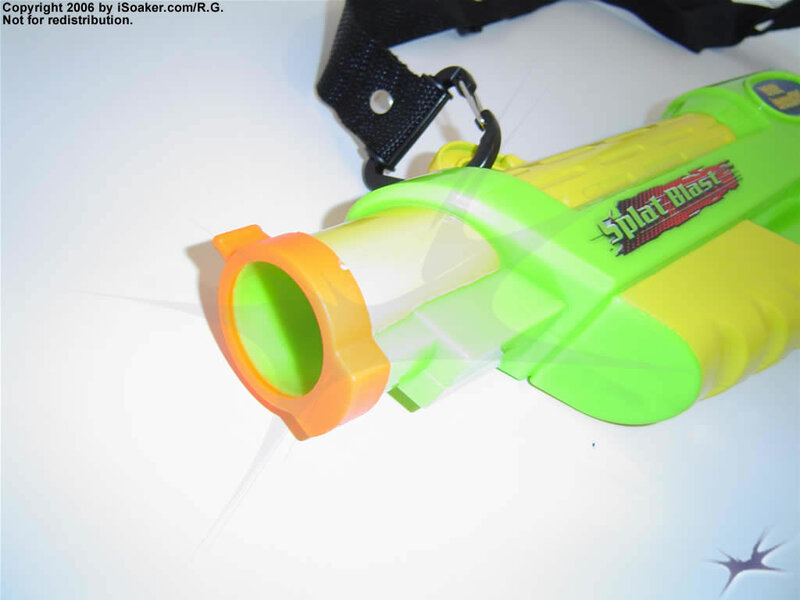 The Splat Blaster's nozzle is powered by a spring-loaded firing chamber. Like a Power Soaker, the firing chamber is piston-based, but unlike Power Soakers, the piston is hooked onto a spring that ends up compressed when the chamber is filled. The trigger locks the spring-loaded piston into place. Pulling the trigger allows the piston to slide freely and the spring pushes the firing chamber's contents out the nozzle. Due to piston and nozzle geometry, the resulting shot has a 'splat' or 'shotgun'-type effect, with the stream breaking up upon exiting the nozzle, covering a larger area than a solid stream. However, this also affects the stream's range; the Water Warriors Splat Blaster's effective range is somewhere between a half and a third of a typical stock soaker. The idea, here, is that while range is limited, this pump'n'shoot system would allow the user to fend off closer opponents. Unfortunately, the actual volume pushed out by the loaded firing chamber is minimal (~15mL/0.5oz.). Watch: Submitted video of the Splat Blaster firing. The pump for the Splat Blaster is a lever, as opposed to the typical rod-pump. Part of the likely reason a lever was chosen is due to the fact that the Splat Blaster's firing chamber is based on a spring and piston that needs to be locked into position by the trigger. Having the pump handle as a lever allows for simpler internal mechanisms to be used. As well, as the Splat Blaster has 'shotgun'-type styling, the lever also adds to the overall look. While functional, the lever-pumping system does feel a little more awkward to use than the typical rod-pump. As such, reloading the chamber after a shot takes a moment longer. However, those fond of Terminator 2 may enjoy the general action of pumping the Splat Blaster up. The trigger and grip area on the Splat Blaster are functional, though minimal. The trigger, itself, seems at times to be slightly too far forward. On a few occassions, after pumping, the pump's handle was mistaken for the trigger, except for the fact that pulling it did not result in the blaster firing. As the trigger locks the firing-chamber assembly in place when the chamber is loaded, pulling it involves its sudden release whichmay, in turn, may slowly wear out the inner locking mechanism. Repeated use will determine just how durable the inner mechanism is. 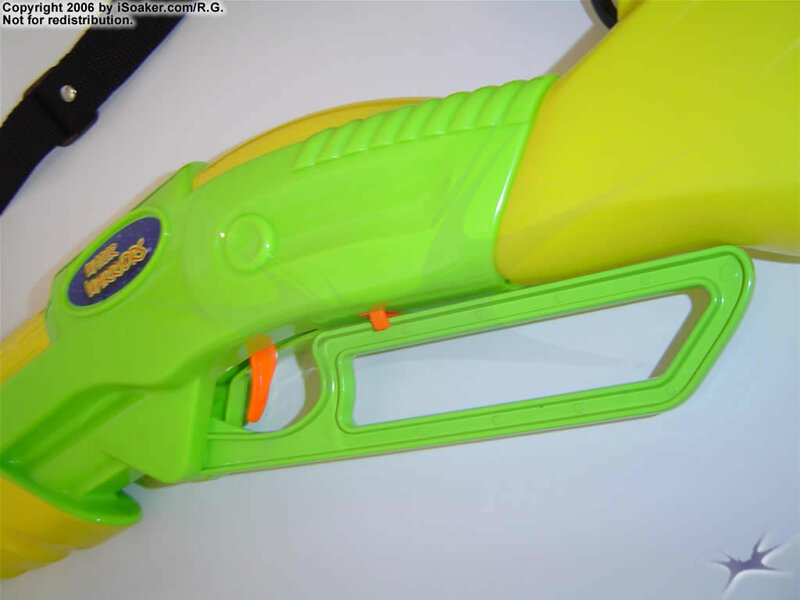 The reservoir on the Splat Blaster is situated within the shoulder stock. While not having a huge capacity, the amount of water the reservoir holds is adequate enough to allow the Splat Blaster to shoot well over 30 times before needing to refill. Due to its position, the added weight of a full tank does make the Splat Blaster slightly back-heavy, but this does not overly imbalance the feel of the soaker. As a whole, Water Warriors Splat Blaster is a simple, light-weight soaker. The styling, design, and capabilities of this soaker make it a decent complementing soaker to be taken along during a water fight. Its power only allows for closer opponents to be targetted, but the fact that it can be relatively quickly loaded and fired makes it a respectable second soaker. The Splat Blaster is a load, aim, and fire single-shot-per-pump type soaker. Unlike other piston-based soakers, the armed shot can be saved for when needed and quickly unleashed in its entirety with a quick pull of the trigger. However, its limited firing chamber capacity reduces the potential value of this otherwise promising soaker design. While not as effective as a primary soaker, the Splat Blaster could still likely perform well against smaller soakers on its own. It would be unwise to take the Splat Blaster alone up against anyone using an Super Soaker XP 70 or larger. However, as a close-quarters addition to a primary soaker, the Splat Blaster can add that extra oomph needed to push an opponent back a moment allowing the user to reposition him/herself. Simple design, clean lines, and good solid feel to the soaker. Single-pull pump and ready to fire. 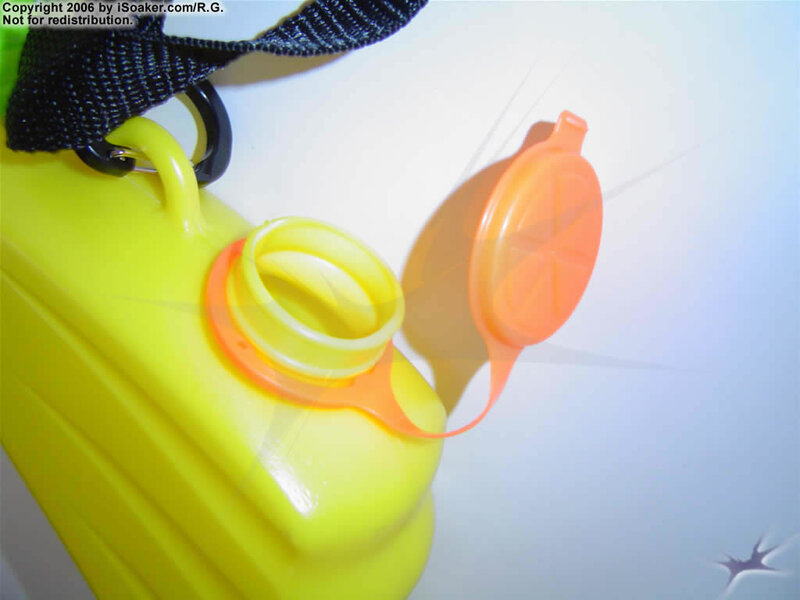 Strap allows soaker to be carried easily as a back-up. Shorter range. Limited firing chamber capacity, thus limited amount of water shot. Single-shot only; no tap shots. Lever pump feels quite different to use than standard rod-based pumps.